Zip lining with Gibbons in Laos | Cheer Up! Posted on October 1, 2015	by Mimi G.
January, 2015: We were in Bokeo, Laos primarily for the Gibbon Experience. Black gibbons are indigenous to this part of Laos, and an endangered species. Poaching and logging over the years reduced their numbers to a pitiful level, and this project is an attempt to raise awareness among adventurous tourists, and provide a better livelihood for the Laotians of the area. The locals have replaced logging and poaching with being tourist guides and protectors of the gibbons. It certainly gives you a unique and wonderful perspective on the jungle. We picked the Classic Trip, which covers the territory of three different gibbon families. To get there, you have a two hour ride in the back of a pickup truck, over dirt track, through brush and river. Follow that with a hard two hour trek, and then you get to the zip lines, the only way to access your home for the next two nights — a basic tree-house perched among the tree tops. It was my first time zip lining, and I looked at the thin cable high above the ground, fading into the trees in the distance. When I realized I had to suspend my body weight from a single tiny wheel and race down that cable, I didn’t think I’d be able to do it. I was terrified. TERRIFIED. In fact, I had to go tandem with the guide a couple of times before I got over my fear and realized just how much fun it could be to fly above the treetops, wind in your face. I am a relatively adventurous spirit, at that. This trip is not for the faint-of-heart, particularly not one who is a zip lining novice. This location has some of the most extensive zip lines in the world, with the longest almost half a km long, suspended 300 m above the ground. This is the only practical way to get around in the dense jungle. In between zip lines, there are stretches of tough uphill hikes. At one point, when the going was getting too rough for me, our guide whipped out his machete and made me a walking stick in a few seconds. Thank goodness for that — to think that this trip is advertised as the one with the least hiking! This experience is also not for the less-than-fit urbanista. 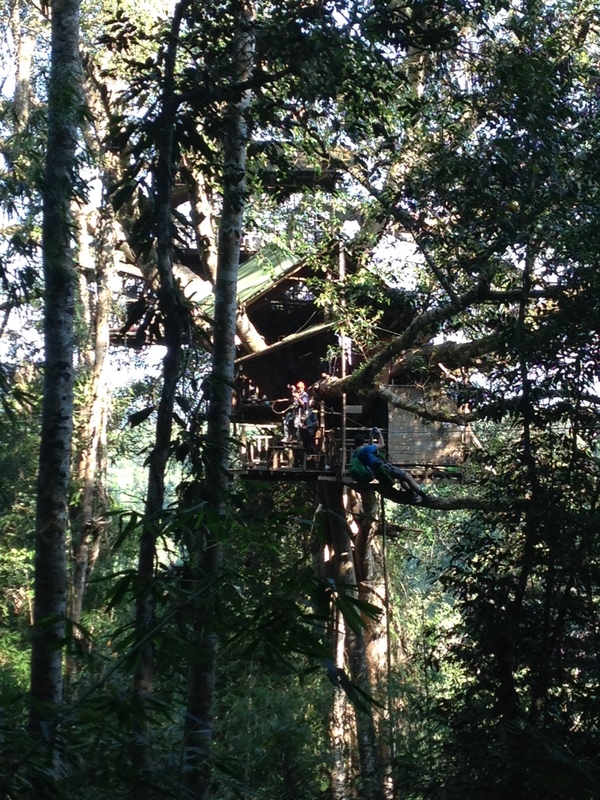 But I felt well rewarded when we eventually reached our tree-house in the late afternoon. It was amazing — three floors, including an open air shower. (I’m telling you, you haven’t lived until you’ve rinsed the grime off your body in rain water, watching the drops fall to the forest floor hundreds of feet below, wondering if there may be a gibbon spying on you!) High up among the treetops, we were surrounded by greenery and birds. The weather was perfect, like fall in North America, and the full moon was out at night. Our guides left food behind, and left us alone for the night — to zipline further, or to absorb the sights and sounds of the jungle. The most distinctive impression for me, the one I’d go back for, is being immersed in all the sounds, especially at dusk and dawn. A hundred kinds of birds calling, the songs of the gibbons, the mysterious rustling and cracking sounds as animals moved through the jungle. As for the gibbons – if you venture into the wild hoping to catch a glimpse of an endangered species, you have to be prepared for some disappointment. We did see one family of gibbons in the distance, making the whole tree shake as they jumped from branch to branch, but we didn’t see any up close. We also saw a loris, its red eyes gleaming at night, and a giant black-tailed squirrel. The final highlight of this trip was the people we shared it with. We had some great conversations — about travel, food, and different cultures in different parts of the world, with lots of loud laughter and off-color jokes thrown in. There were Linda and Monique from Netherlands, who became friends on a skiing trip a few years back. Linda has biker legs and an insatiable love of adventure. She was the first to offer to help me with my safety lines. Monique is quieter and chain smokes. She went solo before me, but remained scared of the longest lines to the end. Eyal and Alen, childhood friends from Israel. Alen has a wacky sense of humor, and constantly took video of himself on the zip lines despite having a fear of heights. Eyal shared the wacky sense of humor with his friend, and combined it with an unobstrusive kindness. He tended to wait for me when I fell behind on the hikes. Ferseni, from Boston. He had a heart valve replacement and pacemaker implant 4 years ago, at 28, and continues with all sorts of strenuous adventures. He is a software engineering consultant who alternates 3 months of work with 3 months of travel. He learnt to sing Arabic songs from his Italian belly-dancer ex-girlfriend. Sean, a professor of International Relations in Hongkong. He has 4 passports, was once homeless in Vancouver, and has done psychotropic substances all over the world. He got tear-gassed 5 times in the recent protests in Hongkong. Finally, our guide, Yia. All of 22 years old, he has been married for 2 years, and like 90% of Laotians today, chose his own wife. He grew up in the next province over, but his parents moved to the Gibbon Experience village when he was 16, and he has worked there as a zip lining guide ever since. His parents and younger brother live with him, his wife and their one year old daughter. He owns a 5 year old motorbike, and he takes English lessons every night from Chris, a guy from Colorado with a handle-bar moustache, who is staying with the guides and photographing gibbons for a year. (All this I gleaned in slow conversation during our arduous treks. )Adios, Laos. I shall remember. This entry was posted in Travel and tagged Asia, Laos, Therapy, Travel. Bookmark the permalink. Pingback: Thailand and Myanmar | Cheer Up!